When pioneering business journalist and Inc. magazine editor at large Bo Burlingham wrote Small Giants, it became an instant classic for its original take on a common business problem—how to handle the pressure to grow. 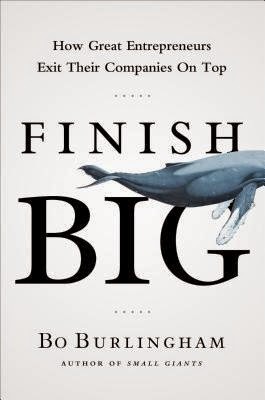 Now Burlingham is back to tackle an even more common problem—how to exit your company well. Sooner or later, all entrepreneurs leave their businesses and all businesses get sold, given away, or liquidated. Whatever your preferred outcome, you need to start planning for it while you still have time and options. The beautiful part is that if you start early enough, the process will lead you to build a better, stronger, more resilient company, as well as one with a higher market value. Unfortunately, most owners don’t start early enough—and pay a steep price for their procrastination. Burlingham interviewed dozens of entrepreneurs across a range of industries and identified eight key factors that determine whether owners are happy after leaving their businesses. His book showcases the insights, exit plans, and cautionary tales of entrepreneurs such as Ray Pagano: founder of a leading manufacturer of housings for security cameras. He turned down a bid for his company and instead changed his management style, resulting in a subsequent sale for four times the original offer. Bill Niman: founder of the iconic Niman Ranch, which revolutionized the meat industry. He learned about unhappy exits when he was forced to sell to private equity investors, leaving him with nothing to show for his thirty-five years in business. Gary Hirshberg: founder of organic yogurt pioneer Stonyfield Farm. He pulled off the nearly impossible task of finding a large company that would buy out his 275 small investors at a premium price while letting him retain complete control of the business. Through such stories, Burlingham offers an illuminating and inspirational guide to one of the most stressful, and yet potentially rewarding, processes business owners must go through. And he explores the emotional challenges they face at every step of the way. At the end of the day, owning a business is about more than selling goods and services. It’s about making choices that shape your entire life, both professional and personal. Finish Big helps you figure out how to face your future with confidence and be able to someday look back on your journey with pride.